Visa varukorgen "Mikropigmenteringsnål 4 point" placerades i din varukorg. Our device for Permanent Make Up (PMU) are certified high-tech product with special needs when it comes to technology and design aspects. Medical hygiene standards, the highest level of precision as well as operator convenience make these a definite benefit for any cosmetics studio. Art. nr. 4001. Kategori: Mikropigmentering. Our devices are made up only of high-quality electronic components. 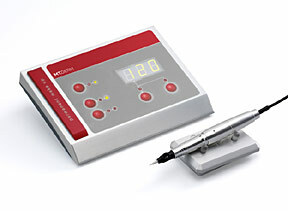 For maximum and flawless results the handpieces are controlled by a microprocessor. This ensures a steady, smooth and uniform needle frequency and therefore provides the best of prerequisites for a high color insertion. 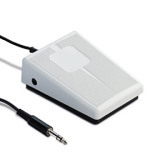 All of the control units can be connected to a foot pedal. 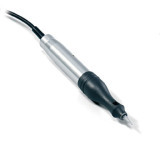 Most of the devices also provide two outlets in order to allow work to take place with several handpieces. The digital control units are easy to clean thanks to the jointless manufacturing and the hygienic keypad. With the exclusive design of several types of housing we also show our high demands with regard to ergonomics and aesthetics.